July 27, 2015 2:31 pm. THE Turnbull Stakes is run in early October and is one of the main races that sets the scene ahead of Melbourne’s spring. The Turnbull Stakes is considered one of the most important races of the Spring Carnival. It is a major lead-up race into the Caulfield Cup, Cox Plate and Melbourne Cups and past winners of the race have gone on to win the biggest race in Australia. Makybe Diva, Efficient and Green Moon took out this race en route to Melbourne Cup wins while Winx recorded a win in the race before winning a third-straight Cox Plate. The Turnbull Stakes is one of the key Group 1 races leading into the big three of the Melbourne spring and the bookmakers treat the event with the respect it is due. Turnbull Stakes odds are up at least a month in advance of the race date and any bookmaker that doesn’t have a market framed by then isn’t worth your cash. Winx is odds on to claim a second-straight Turnbull Stakes. 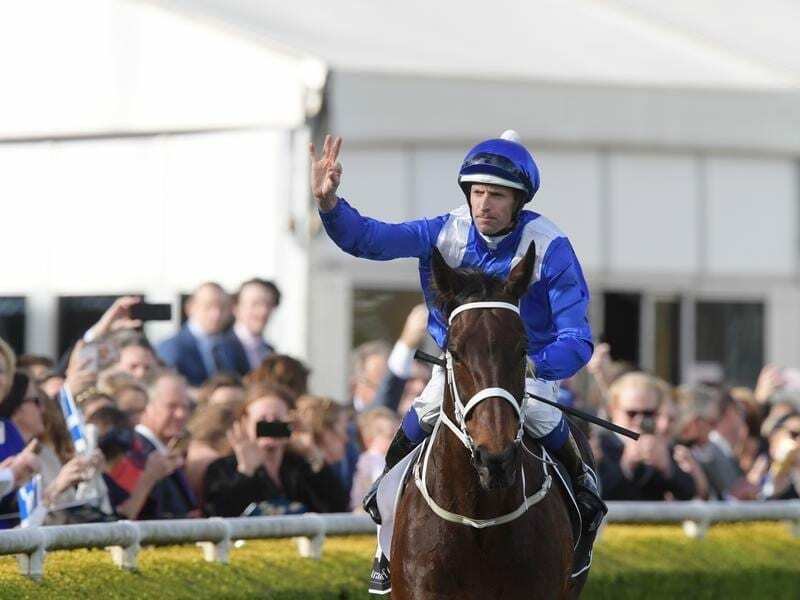 She blitzed them on debut at Flemington and the market believes Winx will be hard to beat once again if she follows the same pathway towards a fourth-straight Cox Plate. The mighty mare is at the $1.25 quote at online bookmaker Ladbrokes to win the 2018 Turnbull Stakes, while Grunt ($6.50), Humidor and Kings Will Dream ($7.50) are the only other runners in single figures. The Turnbull Stakes was promoted to Group 1 level after champion mare Makybe Diva won in 2005 — the same year it won the Cox Plate and her third Melbourne Cup. The 2000m race is for four-year-olds and over at set weights and after being first raced in 1865, there have been plenty of short and long-priced winners. In 2013, Happy Trails scored an upset win over the Melbourne Cup-bound Fawkner and Puissance De Lune, but there have been many favourites win also. Horses such as Elvstroem, Northerly, Sunline, Winx and Doriemus have all used the Turnbull Stakes as a stepping stone to bigger wins later in the carnival and punters see this race as a big form guide to those major races. With such a good form-guide reference, betting the Turnbull Stakes is vital to making money during the Melbourne Spring Carnival and this year’s race promises to provide the good oil once again. The 2018 Turnbull Stakes was all about the wondermare Winx and she duly delivered, just. After getting right back and finding traffic entering the straight a win was looking beyond the mare but those who doubted her looked foolish as Winx found daylight and hit the line like a steam train to record yet another Group 1 win en route to a fourth tilt at the Cox Plate. Winx made her Flemington debut in the Turnbull Stakes in one of the most dominating performances in the race’s history. Balancing up nicely at the jump Winx always looked comfortable and once she decided to win, the race was over. The second placed Ventura Storm wasn’t even in the photo on the line, such was the dominance of the mighty mare. Hartnell had the unfortunate luck of confronting Winx more often than not over the course of his career but the Godolphin champ made the most of the Winx-less field here. Settling just off the speed under James McDonald, Hartnell was produced at the top of the straight and quickly put away his rivals which included subsequent Caulfield Cup winner Jameka. In one of the more spectacular wins you will see in Turnbull Stakes history, Hugh Bowman provided Preferment with an A-Grade ride to take out the race. Coming into the straight the horse was last and looking like an also-ran but under a bustling ride from Bowie the horse kicked it up a gear and began to surge at the 400m. It looked like it could have been too little, too late but the horse found again in the final 100m to topple Royal Descent in the final strides. In a wide-open Turnbull Stakes field it was Lucia Valentina who produced enough when the race was on the line. In a three way go heading towards the 200m, Lucia Valentina fought tooth and nail towards the line to get the neck out on the line to win ahead of Brambles and Lidari. Lidari was later disqualified from the race. Gun runner Happy Trails recorded his second Group 1 victory in spectacular fashion at Flemington. Almost unsighted coming into the latter stages of the race, Happy Trails found a late split and surged to the line to topple Puissance de Lune and Fawkner in a finish that saw five horses separated at the line by less than a length and a half.